The demand for effective cross-cultural training programs in the workplace has grown tremendously over the years. Globalization and the advancement of technology have increased the mobility and connectivity of global talent. It is more important than ever to equip professionals with the ability to communicate and work effectively among different cultures. Some forward-looking higher education institutions are offering intercultural competence training programs for their students. This opportunity gives their students a head start in acquiring the soft skills in high demand and helps them gain a career advantage. For the growing number of international students on campus, participating in intercultural competence training is their path to survival and thrival. An article by the Society for Human and Resource Management (SHRM) discusses how companies can create effective cross-cultural communication training programs. 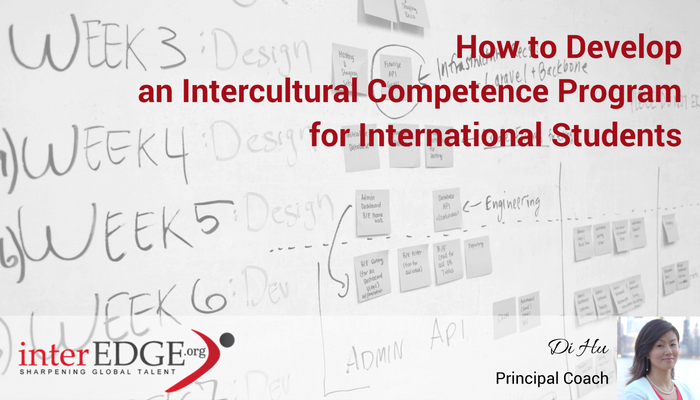 It also offers a few suggestions that shed light on how to develop an intercultural competence program for international students at colleges and universities. Erin Meyer, a professor from the French business school, INSEAD, and the author of The Culture Map, alongside Andrew Molinsky, an associate professor of organizational behavior at Brandeis University’s international business school, and the author of Global Dexterity, both shared their insights through the article. 1. Teaching cultural differences is only a start point in intercultural competence training. “Many existing programs offer little more than etiquette training—such as whether you should bow or shake hands—while failing to address deeper issues that impact communications.” In addition to certain habitual remarks, such as “Americans do this; Chinese do that,” a good training program needs to dig deeper into the why and how. As an example, it is noted that Americans are fond of building a professional network; however, it must further be expounded as to why Americans want to build the said relationships. The training should focus on how individuals can easily adapt to certain behaviors and incorporate it with the different cultural contexts. 2. Combining “cultural congruence” and “cultural differentiation” can be a more effective approach. The former focuses on the assimilation of individuals from different cultures into one mainstream culture. The latter teaches how an individual can maintain his or her own cultural identity while recognizing another value system, as well as various perspectives and mannerisms. 3. A homegrown internal approach can build cultural awareness and cultivate cultural sensitivity. Institutions that are not ready to establish a full-fledged intercultural competence training program can first develop activities and events wherein both domestic and international students from the U.S. and other countries can share critical cultural information with each other and join in collaborative projects. This may help students leverage their educational experience as a launchpad for global careers.